The present invention relates to a composition for cleaning a hard surface and a process of cleaning a hard surface with such a composition. 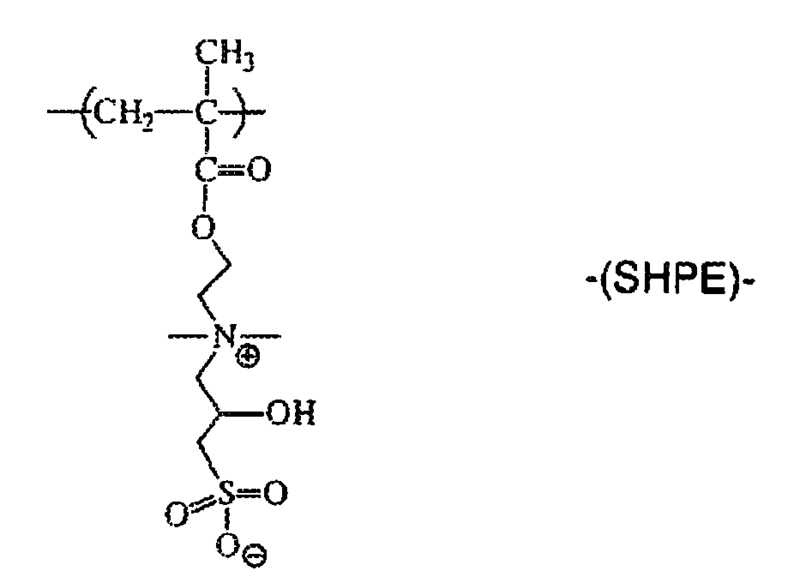 The hard surface cleaning composition herein comprises a specific copolymer as defined herein below. Compositions for cleaning hard surfaces are well known in the art. Manufacturers of such hard surface cleaning compositions are continuously searching for new components that will improve the effectiveness of the compositions. The present invention relates to a new ingredient for use in cleaning of hard surfaces such as floors, tiles, work surfaces, ceramic surfaces, windows, blinds, shades, mirrors, household appliances, etc. In hard surface cleaning applications, the resulting appearance of the hard surface after the hard surface cleaning is of high relevance. Indeed, such a hard surface cleaning application has not only to provide a clean surface but the hard surface should also not show any visible filming and/or streaking. Linked thereto, the hard surface should have a shiny appearance. In addition, providing the hard surface with soil repellency properties, meaning the prevention or at least reduction of deposition of soil after an initial cleaning operation, is a desired property. Moreover, providing a next time cleaning benefit, wherein the subsequent cleaning of an initially cleaned surface is facilitated, is desire. There is also the need to provide a fast-drying benefit on inclined or vertical hard surfaces. With regard to currently marketed hard surface cleaning compositions, it has been found that the performance with regard to filming and/or streaking as well as to shine of such compositions used in hard surface cleaning applications may still be further improved. Furthermore, it has been found that the performance with regard to soil repellency and next time cleaning of such compositions used in hard surface cleaning applications may also still be further improved. Moreover, it has been found that their performance with regard to fast-drying on inclined or vertical hard surfaces may also still be further improved. Thus, the objective of the present invention is to provide a hard surface cleaning composition exhibiting good filming and/or streaking performance, good shine performance, good soil repellency performance, good next time cleaning benefit performance and/or good fast-drying performance on inclined or vertical hard surfaces. It has now been found that this objective can be met by a hard surface cleaning composition as described herein as well as a process of cleaning a hard surface as described herein. Advantageously, the composition and process as described herein provide good cleaning performance. A further advantage of the present invention is that the composition and process herein may be used to clean hard surfaces made of a variety of materials like glazed and non-glazed ceramic tiles, enamel, stainless steel, Inox®, Formica®, vinyl, no-wax vinyl, linoleum, melamine, glass, plastics and plastified wood. The present invention relates to a hard surface cleaning composition comprising a copolymer as described herein below. In an alternative embodiment, the present invention encompasses a process of cleaning a hard surface with a hard surface cleaning composition according to the present invention. In another alternative embodiment, the present invention also encompasses the use of a copolymer as described herein in a process of cleaning a hard surface with a liquid composition comprising said copolymer, wherein good filming and/or streaking and/or shine and/or good soil repellency and/or good next time cleaning benefit and/or good fast-drying performance on inclined or vertical surfaces is achieved. The composition herein may be either a liquid composition or a solid composition. Liquid compositions include gels, pastes, thickened liquid compositions as well as compositions having a water-like viscosity. Solid compositions herein include powders, pellets, bars, and the like. Furthermore, the composition herein may also be a unit-dose hard surface cleaning composition such as a tablet or a water soluble pouch comprising one or more compartments filled with a liquid or a solid composition or a combination thereof. In a preferred embodiment according to the present invention, the hard surface cleaning composition herein is a liquid hard surface cleaning composition. A preferred liquid hard surface cleaning composition herein is an aqueous, liquid hard surface cleaning composition and therefore, preferably comprises water more preferably in an amount of from 50% to 98%, even more preferably of from 75% to 97% and most preferably 80% to 97% by weight of the total composition. Preferred liquid hard surface cleaning composition herein have a viscosity of 1 cps or greater, more preferably of from 1 to 20000 cps, and still more preferably of from 1 to 500 cps at 20°C when measured with a CSL2 100® Rheometer at 20°C with a 4 cm spindle (linear increment from 10 to 100 dyne/cm2 in 2 minutes). The pH of the liquid hard surface cleaning composition according to the present invention may typically be from 0 to 14. In a preferred embodiment, the pH of the liquid hard surface cleaning composition herein is from 7 to 14, preferably from 7.1 to 14, more preferably from 7.1 to 13, even more preferably from 7.1 to 12 and most preferably from 8.0 to 10. Indeed, it has been surprisingly found that the greasy cleaning performance is further improved at these preferred alkaline to neutral pH ranges, preferably alkaline pH ranges. Accordingly, the liquid hard surface cleaning composition herein may further comprise an acid or base (as described herein below) to adjust pH as appropriate, preferably a base. In another preferred embodiment, the pH of the liquid hard surface cleaning composition herein is from 0 to 7, preferably from 0 to 6.9, more preferably from 1 to 6, even more preferably from 2 to 5, and most preferably from pH 3 to 5. Indeed, it has been surprisingly found that cleaning performance, especially on limescale-containing soils, such as limescale and/or hard water marks or greasy soap scum, is further improved at these preferred acidic to neutral pH ranges, preferably acidic pH ranges. Accordingly, the liquid hard surface cleaning composition herein may further comprise an acid or base (as described herein below) to adjust pH as appropriate, preferably an acid. 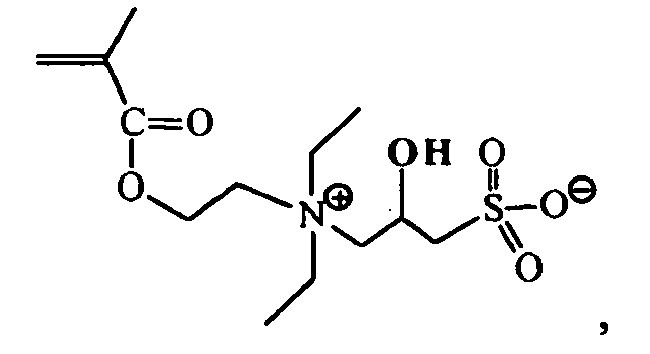 In the preferred embodiment herein, wherein the hard surface cleaning composition herein is a solid composition or contains a solid component (such as for water soluble pouches containing at least one solid component), the solid hard surface cleaning composition herein may further comprise an acid or base (as described herein below) to adjust the pH. A suitable acid for use herein is an organic and/or an inorganic acid. A preferred organic acid for use herein has a pKa of less than 6. A suitable organic acid is selected from the group consisting of citric acid, lactic acid, glycolic acid, succinic acid, glutaric acid and adipic acid and a mixture thereof. A mixture of said acids may be commercially available from BASF under the trade name Sokalan® DCS. A suitable inorganic acid is selected from the group consisting hydrochloric acid, sulphuric acid, phosphoric acid and a mixture thereof. A typical level of such an acid, when present, is of from 0.01 % to 5.0%, preferably from 0.04% to 3.0% and more preferably from 0.05% to 1.5 % by weight of the total composition. Other suitable bases include ammonia, ammonium carbonate, K2CO3, Na2CO3 and alkanolamines (as e.g. monoethanolamine or triethanolamine). Typical levels of such bases, when present, are of from 0.01% to 5.0%, preferably from 0.05% to 3.0% and more preferably from 0.1% to 0.6 % by weight of the total composition. The present invention encompasses a process of cleaning a hard surface with a composition according to the present invention. In a preferred embodiment, the process of cleaning a hard surface herein involves the use of the hard surface cleaning composition according to the present invention in liquid form. By "in liquid form" it is meant herein, the liquid hard surface cleaning composition (as described herein above) either in its neat or diluted form (see herein below) or the solid or unit-dose hard surface cleaning composition (both as described herein above) in dissolved form. By "hard surface", it is meant herein any kind of surface typically found in houses like kitchens, bathrooms, e.g., floors, walls, tiles, windows, cupboards, sinks, showers, shower plastified curtains, wash basins, WCs, fixtures and fittings and the like made of different materials like ceramic, vinyl, no-wax vinyl, linoleum, melamine, glass, Inox®, Formica®, any plastics, plastified wood, metal or any painted or varnished or sealed surface and the like. Hard surfaces also include household appliances including, but not limited to refrigerators, freezers, washing machines, automatic dryers, ovens, microwave ovens, dishwashers and so on. Such hard surfaces may be found both in private households as well as in commercial, institutional and industrial environments. It is understood that the present invention does not encompass cleaning compositions for dishware and thus the hard surface cleaning compositions herein do not encompass dishwashing compositions and the process of cleaning hard surfaces herein does not encompass dishwashing. Indeed, hard surfaces herein do not encompass dishware. In a preferred embodiment according to the present invention, the hard surface to be cleaned in the process herein is selected from the group consisting of ceramic, glass, enamel, stainless steel, chromed surfaces and Formica®. Preferably, the hard surface to be cleaned in the process herein is selected from the group consisting of bathroom hard surfaces preferably selected from the group consisting of : ceramic, glass, enamel, stainless steel and chromed surfaces. In a preferred embodiment of the present invention said hard surface is inclined or vertical. Inclined or vertical hard surfaces include mirrors, lavatory pans, urinals, drains, side wall of bathtubs and shower stalls, waste pipes and the like. Such vertical or inclined surfaces can often be found in bathrooms. By "diluted form", it is meant herein that said liquid composition is diluted by the user typically with water. The liquid composition is diluted prior to use to a typical dilution level of 10 to 400 times its weight of water, preferably from 10 to 200 and more preferably from 10 to 100. A usually recommended dilution level is a 1.5% dilution of the composition in water. By "in its neat form", it is to be understood that said liquid composition is applied directly onto the surface to be treated without undergoing any dilution, i.e., the liquid composition herein is applied onto the hard surface as described herein. An alternative preferred embodiment of the present invention provides that a solid or unit-dose hard surface cleaning composition is applied onto the surface to be treated. The composition is in its dissolved form. By "dissolved form", it is meant herein that said solid or unit-dose hard surface cleaning composition is dissolved by the user typically in water. The solid or unit-dose hard surface cleaning composition is dissolved prior to use to a typical dissolution level of 10 to 400 times its weight in water, preferably from 10 to 200 and more preferably from 10 to 100. A usually recommended dissolution level is a 1.5% dissolution by weight of the composition in water. In the process herein, the hard surface cleaning composition herein is applied onto said surface by conventional means known by the skilled person. Indeed, the composition herein may be applied by pouring or spraying said composition, preferably in liquid form, onto said surface. In a preferred embodiment, the process of cleaning a hard surface herein includes the steps of applying, preferably spraying, said hard surface cleaning composition, preferably in liquid form, onto said hard surface, leaving said hard surface cleaning composition to act onto said surface for a period of time to allow said composition to act, preferably without applying mechanical action, and optionally removing said hard surface cleaning composition, preferably removing said hard surface cleaning composition by rinsing said hard surface with water and/or wiping said hard surface with an appropriate instrument, e.g., a sponge, a paper or cloth towel and the like. In a highly preferred embodiment of the present invention the liquid hard surface cleaning composition herein is sprayed onto said hard surface. More preferably, said liquid hard surface cleaning composition is sprayed in its neat form onto said hard surface. In another preferred process of cleaning a hard surface according to the present invention, said hard surface cleaning composition is applied onto said surface in diluted form without rinsing the hard-surface after application in order to obtain good soil/stain removal performance. By "rinsing", it is meant herein contacting the hard surface cleaned with the process according to the present invention with substantial quantities of appropriate solvent, typically water, directly after the step of applying the liquid composition herein onto said hard surface. By "substantial quantities", it is meant herein between 0.01 lt. and 1 lt. of water per m2 of hard surface, more preferably between 0.1 lt. and 1 lt. of water per m2 of hard surface. The hard surfaces to be treated may be soiled with a variety of soils, e.g., greasy soils (e.g., greasy soap scum, body grease, kitchen grease or burnt/sticky food residues typically found in a kitchen and the like), particulate greasy soils or so called "limescale-containing stains". By "limescale-containing stains" it is meant herein any pure limescale stains, i.e., any stains composed essentially of mineral deposits, as well as limescale-containing stains, i.e., stains which contain not only mineral deposits like calcium and/or magnesium carbonate but also soap scum (e.g., calcium stearate) and other grease (e.g. body grease). In an alternative embodiment herein, the liquid hard surface cleaning composition herein is impregnated onto a substrate, preferably a nonwoven substrate, to form a premoistened hard surface cleaning wipe. Indeed, the process of cleaning a hard surface according to the present invention preferably comprises the steps of contacting a premoistened hard surface cleaning wipe comprising the liquid hard surface cleaning composition herein impregnated onto a substrate with said hard surface and more preferably wiping said hard surface with said wipe. By "a sulphobetaine group" it is meant herein, a group comprising an anionic group and a cationic group, with at least one of the groups containing a sulphur atom. By "unit derived from a monomer" it is meant herein, the different units of the Aprecursor units, to denote a unit which may be obtained directly from said monomer through polymerisation. Indeed, a unit deriving from an acrylic or methacrylic acid ester does not cover a unit with formula -CH2-CH(COOH)-, -CH2-C(CH3)(COOH)-, -CH2-CH(OH)-, respectively, obtained by polymerizing an acrylic or methacrylic acid ester or a vinyl acetate ester respectively, then hydrolyzing, for example. A unit deriving from acrylic or methacrylic acid covers, for example, a unit obtained by polymerizing a monomer (for example an acrylic or methacrylic acid ester), then making the obtained polymer react (for example by hydrolysis) so as to obtain units with formula -CH2-CH(COOH)-, or - CH2-C(CH3)(COOH)-. A unit deriving from a vinyl alcohol covers, for example, a unit obtained by polymerizing a monomer (for example a vinyl ester), then making the obtained polymer react (for example by hydrolysis) so as to obtain units with formula - CH2-CH(OH)-. Units deriving from an A monomer may have been obtained, for example, through polymerisation of A precursor monomers, then post-polymerisation reaction to obtain units comprising the betaine group. The A units are not considered units deriving from A precursor monomers not containing the betaine group. By "molar mass" it is meant herein unless otherwise stated, the average molar mass in absolute mass, expressed in g/mol. This can be determined by permeation chromatography of aqueous gel (GPC), by light diffusion (DDL or MALLS for an aqueous solvent), with an aqueous solvent or an organic solvent (for example formamide), according to the composition of the polymer. Unless otherwise stated, the quantities and proportions herein are indicated in active matter (as opposed to diluted or dispersed matter) and in weight. the units B being units derived from vinyl-pyrrolidone, and wherein in said copolymer said units A and B represent 75 to 100%, in moles of the copolymer units. It preferably involves a statistical copolymer. In a preferred embodiment according to the present invention, the units A, B, as well as possibly with other optional units, form a polyalkylene hydrocarbon chain possibly broken by one or more nitrogen or sulphur atoms. The betaine group of the units A contains an anionic group and a cationic group, with at least one of the groups containing a sulphur atom. The anionic group may be a carbonate group, a sulphuric group such as a sulphonate group, a phosphorus group such as a phosphate, phosphonate, phosphinate group, or an ethanolate group. It is preferably a sulphuric group. The cationic group may be an onium or inium group from the nitrogen, phosphate or sulphur family, for example an ammonium, pyridinium, imidazolinimum, phosphonium or sulphonium group. It is preferably an ammonium group (preferably quaternary). Preferably, the betaine group is a sulphobetaine group containing a sulphonate group and a quaternary ammonium group. 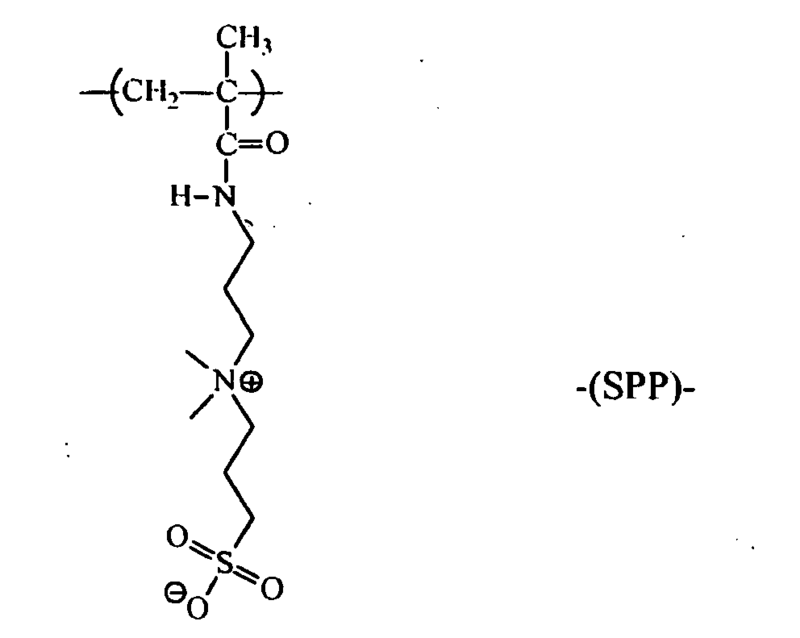 The present invention encompasses copolymers containing different betaine groups as units A in the copolymer. The betaine groups are typically the pendant groups of the copolymer, typically obtained from monomers containing at least one ethylene non-saturation. At the core of the units A, the number of positive charges is equal to the number of negative charges. The units A are electrically neutral, in at least one pH range. R1, R2 and R5, are similar or different, and represent an alkyl radical containing 1 to 7 carbon atoms, preferably 1 to 2. R6 represents a hydrocarbon radical forming, with the nitrogen atom, a saturated or unsaturated nitrogen heterocycle, comprising possibly one or more other heteroatoms, preferably nitrogen. - wherein R1, R2, R and A have the definition stated above. The betaine groups may be connected to the carbon atoms of a macromolecular chain derived from the polymerisation of an ethylene non-saturation (dorsal, skeleton) of the copolymer by the intermediary, namely of a bivalent or polyvalent hydrocarbon pattern (for example alkylene or arylene), possibly broken by one or several heteroatoms, namely of oxygen or nitrogen, an ester pattern, an amide pattern, or even by a valency link. The copolymer herein may be obtained by radical polymerisation : of monomers A comprising an ethylenically unsaturated betaine group, namely of ethylenically unsaturated monomers containing at least one betaine group with the above formulae, and vinyl pyrrolidone, from which the unit B derives. 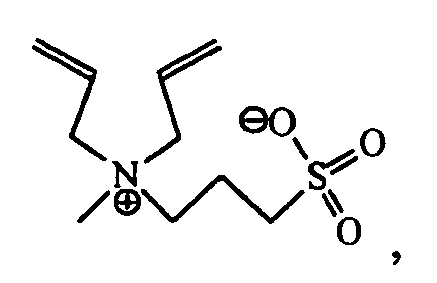 betaines from cyclic acetals, preferably ((dicyanoethanolate) ethoxy) dimethyl ammonium propyl methacrylamide. 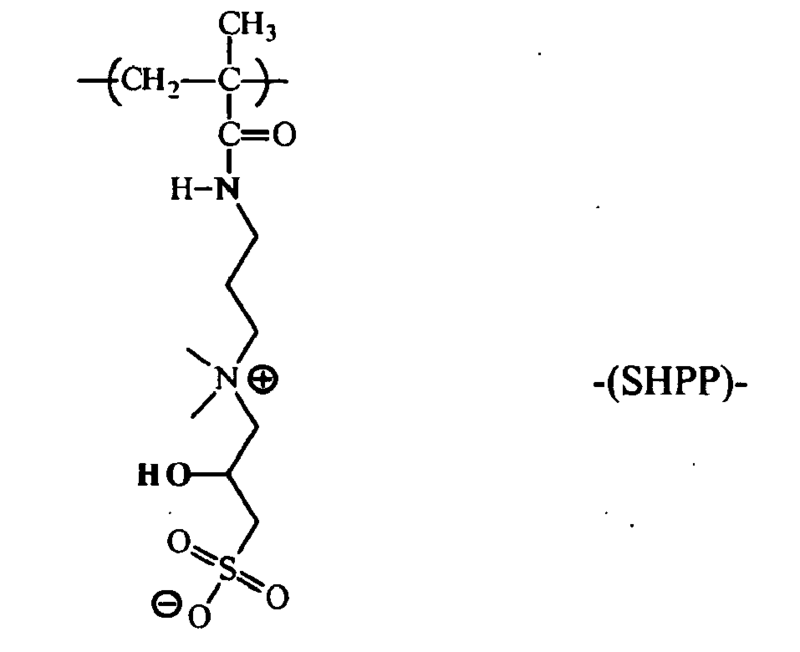 The copolymer according to the present invention, can also be obtained in a known method by chemically modifying a polymer (copolymer) called precursor polymer, containing the A precursor units, which are modified (botanized) by a post-polymerisation reaction to achieve the units A being a betaine group. 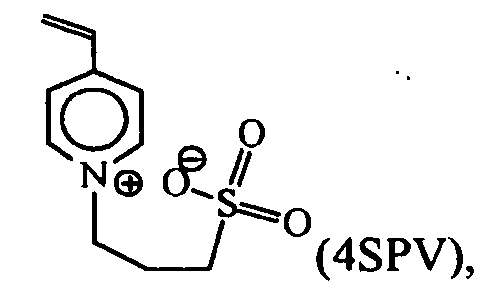 Sulphobetaine units can thus be obtained by chemically modifying precursor polymer units, preferably by chemically modifying a polymer containing pendant amine functions, with the help of a sulphuric electrophile compound, preferably a sultone (propanesultone, butanesultone), or a halogenoalkylsulphonate. Japanese patent application published on 21 December 1999, under number 11-349826 . The units B are units derived from vinyl-pyrrolidone. Such monomers are known in the art. Preferably unit B is N-vinyl-pyrrolidone. The copolymer according to the present invention may comprise optional units C other, different from units A and B mentioned herein above. Units A and B represent 75 to 100% in moles of the total copolymer units. 75 to 99% in moles of units B, preferably 87 to 97%. According to another preferred embodiment herein, the molar ratio between the units A and B is between 1/99 and 25/75, preferably between 5/95 and 15/85. cationic or potentially cationic CC units. The copolymer herein does not comprise more than 25% in moles for the total of such units C other, preferably none at all. The copolymer herein does not comprise more than 25% in moles for the total CN units, preferably none at all. The copolymer herein does not comprise more than 25% in moles for the total CA units, preferably none at all. The copolymer herein does not comprise more than 25% in moles for the total CC units, preferably none at all. hydroxyalkyl acrylate or methacrylate units. It is understood that the copolymer herein may be in any practical form, for example in solid or dry form, or for example in the form of a solution, emulsion, suspension or dispersion, namely in the form of an aqueous solution. The solution, emulsion, suspension or dispersion form, for example, the aqueous solution, may comprise 5 to 50% in the copolymer weight, for example 10 to 30% in weight. The aqueous solution may, in fact, be a solution obtained by a preparation process in an aqueous phase, namely a radical polymerisation process. The polymer herein may have a molar mass going from 20000 g/mol to 1000000 g/mol, preferably from 100000 to 400000 g/mol. The copolymer according to the present may be prepared by any suitable process. The process generally involves a radical polymerisation (copolymerization) step, where monomers and a free radicals source are introduced. According to a preferred embodiment herein, a mixture of A precursor and vinyl-pyrrolidone monomers are polymerized (copolymerization) in the presence of a free radicals source to obtain a copolymer comprising units B and units deriving from the A precursor units. These units are then chemically modified to obtain units A (post polymerisation modification). The modifications are mentioned above, in the section detailing the A units. Such radical polymerisation processes are known in the art and by the skilled person. It is possible to vary, in particular, the free radicals source, the amount of free radicals, the phases for introducing the different compounds (monomers, free radicals source etc...), the polymerisation temperature, and other operating parameters or conditions in a known and suitable way. Some details and instructions are provided herein below. The processes may be discontinuous ("batch"), semi-continuous ("semi-batch") or even continuous. A semi-continuous process typically involves a phase of progressive introduction of at least one monomer (co-monomer), preferably all monomers (comonomers) into a reactor, without continuously removing the reaction product. This product, containing the polymer, is collected all at once after the reaction. Advantageously, polymerisation can be done in an aqueous solution. Any free radicals source may be used. Free radicals can be generated spontaneously, for example by raising the temperature, with suitable monomers like styrene. Free radicals can be generated by irradiation, namely UV irradiation, preferably in the presence of suitable initiators sensitive to UV. Initiators (or "igniters") or redox or radical initiator systems can be used. The free radicals source can be water-soluble or non water-soluble. Preferably water-soluble, or at least partially water-soluble, initiators (for example water-soluble to at least 50% in weight) are used. Generally, the greater the amount of free radicals, the easier it is to initiate polymerisation (which is preferred), but the lower the molecular masses of the copolymers obtained. alkaline metal persulphates in association with an arylphosphinic acid, such as benzene phosphonic acid and similar, and reducing sugars. The polymerisation temperature may be between 25°C and 95°C and may depend on the free radicals source. If it does not involve a UV initiator source, it is preferable to operate between 50°C and 95°C, more preferably between 60°C and 80°C. In general, the higher the temperature, the easier it is to initiate polymerisation (which is preferred), but the lower the molecular masses of the copolymers obtained. In the composition of the present invention, the copolymer herein is preferably present at a level of from 0.001% to 10%, more preferably from 0.005% to 1%, most preferably from 0.01% to 0.5% by weight of the hard surface cleaning composition. It has been found that the presence of the specific copolymer according to the present invention in a hard surface cleaning composition used to clean a hard surface allows to provide improved filming and/or streaking performance and linked thereto improved shine performance as compared to the use in the same hard surface cleaning application of a composition that is free of the copolymer herein. Furthermore, it has been found that the presence of the specific copolymer according to the present invention in a hard surface cleaning composition used to clean a hard surface allows to provide improved soil repellency properties to the hard surface after an initial cleaning operation with the compositions according to the present invention. Moreover, it has been found that the presence of the specific copolymer according to the present invention in a hard surface cleaning composition used to clean a hard surface allows to provide improved next time cleaning benefit properties to the hard surface after an initial cleaning operation with the compositions according to the present invention. In addition, it has been found that the presence of the specific copolymer according to the present invention in a hard surface cleaning composition used to clean a hard surface allows to provide fast-drying benefit properties on inclined or vertical surfaces as compared to the use in the same hard surface cleaning application of a composition that is free of the copolymer herein. After the cleaning of a hard surface residues may be left on the hard surface cleaned. Indeed, due to the fact that the cleaning composition applied onto the surface is not or only partially rinsed off the surface or removed from the surface (e.g., wiped off), the cleaning composition (partially or completely) along with a part of the soil present on the hard surface is left on the surface (another part of the soil is captured in the implement (e.g., mop), if any used). Such residues often lead to visible films and/or streaks on the cleaned hard surface and may impair the shine of the hard surface. Moreover, cleaned surfaces are prone to re-soiling due to their normal use. Indeed, marks, soils, stains and the like of various kinds are deposited on hard surface upon use (e.g., soil carried onto a floor sticking the bottom of shoes). It has surprisingly been found that the inclusion of said copolymer in a hard surface cleaning composition used in a hard surface cleaning application provides a composition that increases the transparency of the residues (after drying) left on the hard surface after cleaning. Such an increase in transparency results in the residues being less or even not at all visible, which in turns significantly contributes to the fact that films and/or streaks are barely or even not at all visible on the cleaned hard surface and also to an improved shine of the cleaned hard surface. Furthermore, it has surprisingly been found that on a hard surface initially cleaned with the hard surface cleaning compositions herein using, soils deposition is reduced or even prevented. Indeed, so-called soil repellency properties are observed. In addition, it has surprisingly been found that on a hard surface initially cleaned with the hard surface cleaning compositions herein us, a next time cleaning benefit is observed. Indeed, subsequent cleaning operations of an initially cleaned surface are facilitated. Furthermore, it has surprisingly been found that the inclusion of said copolymer in a hard surface cleaning composition used in a hard surface cleaning application provides fast-drying benefit properties on inclined or vertical surfaces. Therefore, in one embodiment, the present invention encompasses the use of a copolymer as described herein in a process of cleaning a hard surface with a liquid composition comprising said copolymer, wherein good filming and/or streaking and/or shine (preferably upon rinsing with water) and/or good soil repellency and/or good next time cleaning benefit and/or good fast-drying performance (preferably upon rinsing with water) on inclined or vertical surfaces is achieved. It has been found that the soil repellence benefit and/or the next time cleaning benefit as described herein, is particularly beneficial on greasy soap scum soils that is mostly observed in a bathroom environment (e.g., as residues in bathtubs or shower stalls). Therefore, in one highly preferred embodiment according to the present invention, the hard surface cleaning composition herein is an acidic to neutral, preferably acidic, hard surface cleaning composition, preferably used to clean bathroom hard surfaces (as described herein above). The preferred pH range and bathroom hard surfaces also apply to the claimed use, as described herein above. The hard surface cleaning composition is diluted to a 1.2% level (detergent solution) in normal tap-water, if needed adjusted with CaCl2 to achieve a particular water hardness of interest, mostly 16 gpg. 19 g (+/- 0.2 g) of said detergent solution is applied on a Vileda® cloth (20 cm * 9 cm), followed by wiping lightly covering a surface of four black glossy ceramic tiles (20*25 cm each), wherein approx. 1 g. (+/- 0.2 g) of detergent solution is left on the tile. Afterwards the tile is left to dry without rinsing at constant temperature (22°C) and constant humidity (30-40% rH). The shine performance is evaluated by visual assessment of a tile being cleaned with a wash solution containing polymer, versus a tile being cleaned with the same wash solution though not containing the polymer. The filming / streaking and/or shine performance of said composition can be assessed by visual grading. The visual grading may be performed by a group of expert panellists using panel score units (PSU). To assess the filming / streaking and/or shine performance of a given composition a PSU-scale ranging from 0, meaning a poor filming / streaking and/or shine impression (i.e., visible filing /streaking; no shine) of the given composition, to 6, meaning a good filming / streaking and/or shine impression (i.e., no visible filing /streaking; excellent shine) of the given composition, can be applied. 3 ml of hard surface cleaning composition to be assessed is applied neat onto black glossy ceramic tiles (20*25 cm each), followed by wiping lightly with a dry Vileda® cloth (20 cm * 9 cm) to spread the product uniformly. The product is left to act for 15 seconds, then the tile (in vertical position) is rinsed with tap water for 30 second (water flow approx. 4 liters per minute). The tile is left to dry at constant temperature (22°C) and constant humidity (30-40% rH). The drying time is measured, and the shine performance of said composition can be assessed by visual grading as described herein above. A clean white ceramic tile (ex Villeroy & Bosch® UT01 Series Unit 1 - dimensions 7*25cm) is pretreated with test and reference products to be assessed by using a "Wet Abrasian Scrub Tester - Ref. 903PG/SA/B, available from Sheen Instruments Limited), a straight-line washability machine having 4 cleaning tracks and 4 sponge holders. Two cleaning tracks are preconditioned with a wet sponge (yellow cellulose sponge, Type 7 ex Spontex US - total weight wet sponge = 22g +/- 2 g) to which 20ml (+/-0.2 ml) of a 1.2% detergent solution (see above for preparation) is added, the two other cleaning tracks are preconditioned with a wet sponge containing 20ml (+/-0.2 ml) of a 1.2% wash solution of a reference detergent solution. The tile is pretreated over 20 cycles, followed by allowing the tile to dry at constant temperature (25°C) and humidity (70% rH) for at least 2 hours, preferably overnight. A soil mix of polymerized oil and particulate soil is prepared and 0.085g of the soil mix is homogeneously distributed over the pretreated tile. After application, the soiled tile is left to condition for 3-5 hours, preferably overnight, at constant temperature (25°C) and humidity (70% rH). To cross-evaluate the cleaning performance of the test versus reference detergent solution, the number of counts is recorded to fully clean the pretreated tile areas by a sponge containing 20ml (+/-0.2 ml) of the corresponding 1.2% detergent solution, using the "Wet Abrasian Scrub Tester" as mentioned above. The hard surface cleaning compositions according to the present invention may comprise a variety of optional ingredients depending on the technical benefit aimed for and the surface treated. Suitable optional ingredients for use herein include surfactants, builders, chelants, polymers, buffers, bactericides, preservatives, hydrotropes, colorants, stabilisers, radical scavengers, bleaches, bleach activators, enzymes, soil suspenders, dye transfer agents, brighteners, anti dusting agents, dispersants, dye transfer inhibitors, pigments, silicones, perfumes and/or dyes. The compositions herein may comprise a nonionic, anionic, zwitterionic and amphoteric surfactant or mixtures thereof. Said surfactant is preferably present at a level of from 0.01% to 20% of composition herein. Suitable surfactants are those selected from the group consisting of nonionic, anionic, zwitterionic and amphoteric surfactants, having hydrophobic chains containing from 8 to 18 carbon atoms. 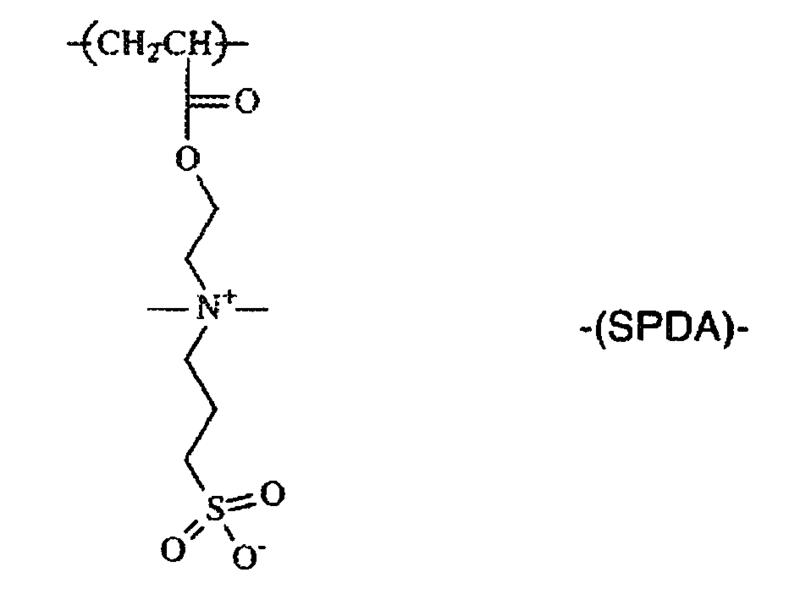 Examples of suitable surfactants are described in McCutcheon's Vol. 1: Emulsifiers and Detergents, North American Ed., McCutcheon Division, MC Publishing Co., 2002. Preferably, the hard surface cleaning composition herein comprises from 0.01 % to 20%, more preferably from 0.5% to 10%, and most preferably from 1% to 5% by weight of the total composition of a surfactant or a mixture thereof. Non-ionic surfactants are highly preferred for use in the compositions of the present invention. Non-limiting examples of suitable non-ionic surfactants include alcohol alkoxylates, alkyl polysaccharides, amine oxides, block copolymers of ethylene oxide and propylene oxide, fluoro surfactants and silicon based surfactants. Preferably, the aqueous compositions comprise from 0.01% to 20%, more preferably from 0.5% to 10%, and most preferably from 1% to 5% by weight of the total composition of a non-ionic surfactant or a mixture thereof. Also suitable for use in the present invention are the fluorinated nonionic surfactants. 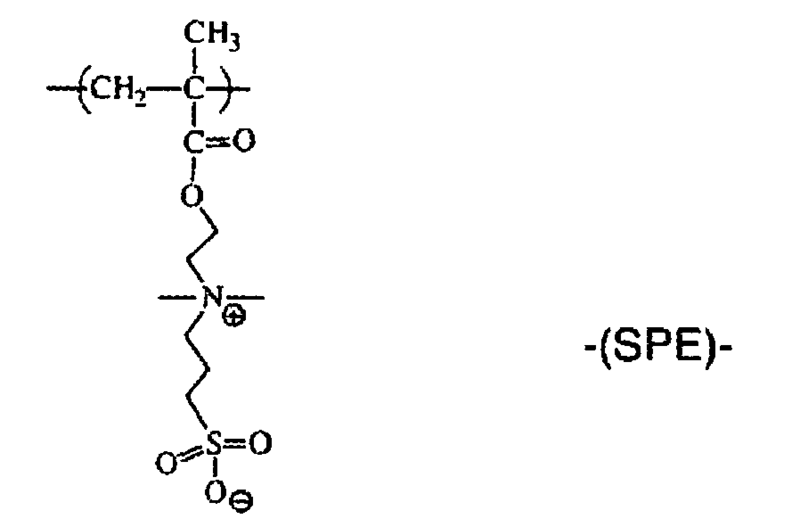 One particularly suitable fluorinated nonionic surfactant is Fluorad F170 (3M Corporation, 3M Center, St. Paul, MN, USA). Fluorad F170 has the formula C8F17SO2N(CH2-CH3)(CH2CH2O)x. Also suitable for use in the present invention are silicon-based surfactants. One example of these types of surfactants is Silwet L7604 available from Dow Chemical (1691 N. Swede Road, Midland, Michigan, USA). Suitable alkyl sulphate surfactants for use herein are according to the formula R1SO4M wherein R1 represents a hydrocarbon group selected from the group consisting of straight or branched alkyl radicals containing from 6 to 20 carbon atoms and alkyl phenyl radicals containing from 6 to 18 carbon atoms in the alkyl group. M is H or a cation, e.g., an alkali metal cation (e.g., sodium, potassium, lithium, calcium, magnesium and the like) or ammonium or substituted ammonium (e.g., methyl-, dimethyl-, and trimethyl ammonium cations and quaternary ammonium cations, such as tetramethyl-ammonium and dimethyl piperdinium cations and quaternary ammonium cations derived from alkylamines such as ethylamine, diethylamine, triethylamine, and mixtures thereof, and the like). Particularly preferred branched alkyl sulphates to be used herein are those containing from 10 to 14 total carbon atoms like Isalchem 123 AS®. Isalchem 123 AS® commercially available from Enichem is a C12-13 surfactant which is 94% branched. This material can be described as CH3-(CH2)m-CH(CH2OSO3Na)-(CH2)n-CH3 where n+m=8-9. Also preferred alkyl sulphates are the alkyl sulphates where the alkyl chain comprises a total of 12 carbon atoms, i.e., sodium 2-butyl octyl sulphate. Such alkyl sulphate is commercially available from Condea under the trade name Isofol® 12S. Particularly suitable liner alkyl sulphonates include C12-C16 paraffin sulphonate like Hostapur® SAS commercially available from Hoechst. Suitable alkyl alkoxylated sulphate surfactants for use herein are according to the formula RO(A)mSO3M wherein R is an unsubstituted C6-C20 alkyl or hydroxyalkyl group having a C6-C20 alkyl component, preferably a C12-C20 alkyl or hydroxyalkyl, more preferably C12-C18 alkyl or hydroxyalkyl, A is an ethoxy or propoxy unit, m is greater than zero, typically between 0.5 and 6, more preferably between 0.5 and 3, and M is H or a cation which can be, for example, a metal cation (e.g., sodium, potassium, lithium, calcium, magnesium, etc. ), ammonium or substituted-ammonium cation. 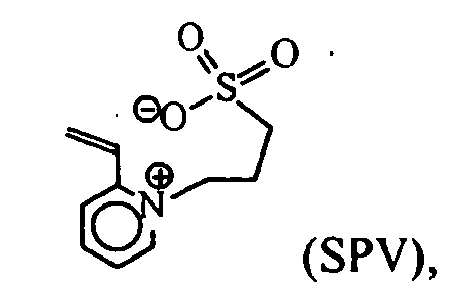 Alkyl ethoxylated sulfates as well as alkyl propoxylated sulfates are contemplated herein. Specific examples of substituted ammonium cations include methyl-, dimethyl-, trimethyl-ammonium and quaternary ammonium cations, such as tetramethyl-ammonium, dimethyl piperdinium and cations derived from alkanolamines such as ethylamine, diethylamine, triethylamine, mixtures thereof, and the like. 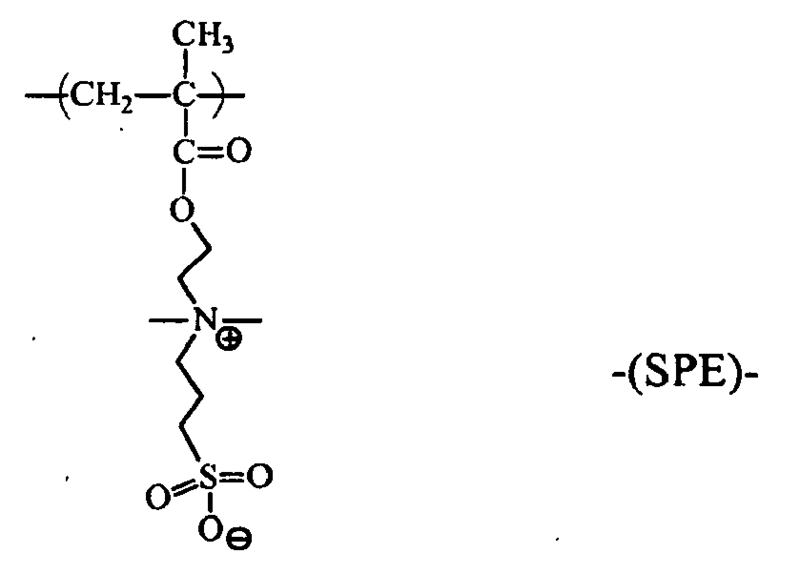 Exemplary surfactants are C12-C18 alkyl polyethoxylate (1.0) sulfate (C12-C18E(1.0)SM), C12-C18 alkyl polyethoxylate (2.25) sulfate (C12-C18E(2.25)SM), C12-C18 alkyl polyethoxylate (3.0) sulfate (C12-C18E(3.0)SM), and C12-C18 alkyl polyethoxylate (4.0) sulfate (C12-C18E(4.0)SM), wherein M is conveniently selected from sodium and potassium. Other anionic surfactants useful herein include salts (including, for example, sodium, potassium, ammonium, and substituted ammonium salts such as mono-, di- and triethanolamine salts) of soap, C8-C24 olefinsulfonates, sulphonated polycarboxylic acids prepared by sulphonation of the pyrolyzed product of alkaline earth metal citrates, e.g., as described in British patent specification No. 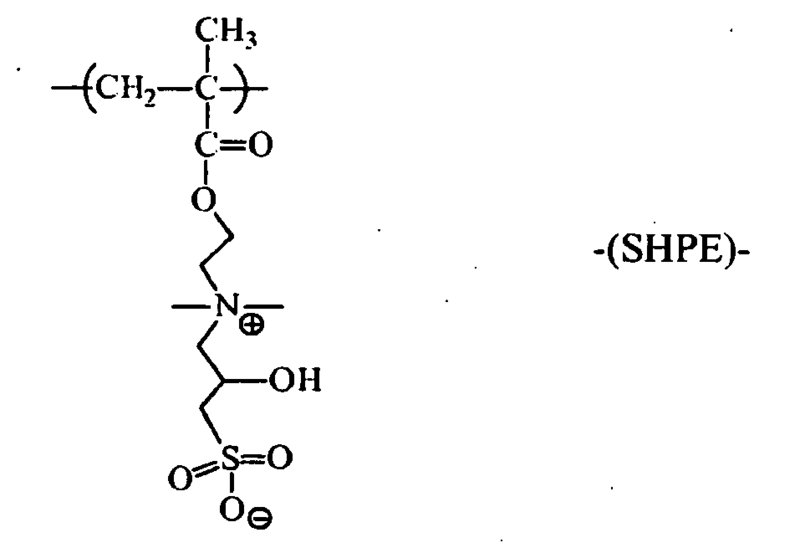 1,082,179 , C8-C24 alkylpolyglycolethersulfates (containing up to 10 moles of ethylene oxide); alkyl ester sulfonates such as C14-16 methyl ester sulfonates; acyl glycerol sulfonates, fatty oleyl glycerol sulfates, alkyl phenol ethylene oxide ether sulfates, alkyl phosphates, isethionates such as the acyl isethionates, N-acyl taurates, alkyl succinamates and sulfosuccinates, monoesters of sulfosuccinate (especially saturated and unsaturated C12-C18 monoesters) diesters of sulfosuccinate (especially saturated and unsaturated C6-C14 diesters), acyl sarcosinates, sulfates of alkylpolysaccharides such as the sulfates of alkylpolyglucoside (the nonionic nonsulfated compounds being described below), alkyl polyethoxy carboxylates such as those of the formula RO(CH2CH2O)kCH2COO-M+ wherein R is a C8-C22 alkyl, k is an integer from 0 to 10, and M is a soluble salt-forming cation. Resin acids and hydrogenated resin acids are also suitable, such as rosin, hydrogenated rosin, and resin acids and hydrogenated resin acids present in or derived from tall oil. 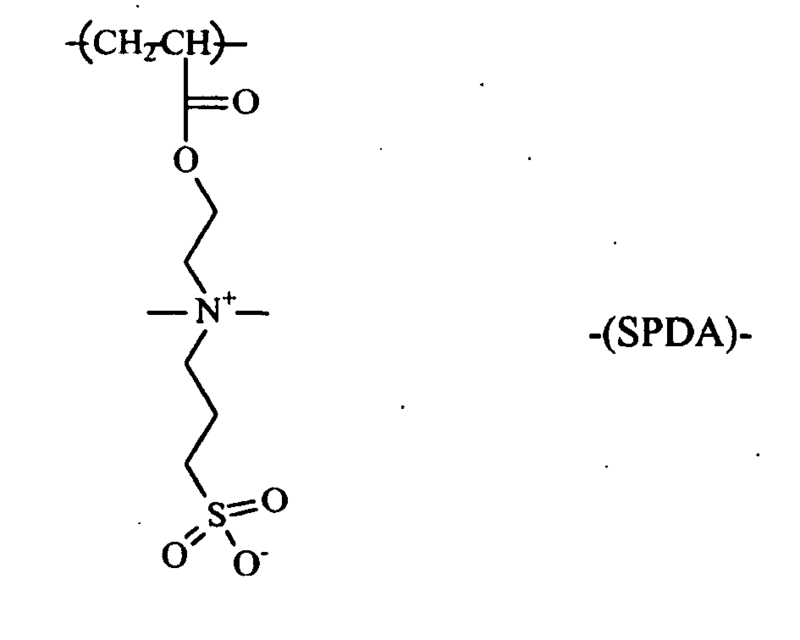 Further examples are given in "Surface Active Agents and Detergents" (Vol. I and II by Schwartz, Perry and Berch). A variety of such surfactants are also generally disclosed in U.S. Patent 3,929,678, issued December 30, 1975 to Laughlin, et al. at Column 23, line 58 through Column 29, line 23. The weight ratio of water-soluble or water-dispersible copolymer herein to nonionic, anionic, amphoteric, zwitterionic surfactant or mixtures thereof is between 1:100 and 10: 1, more preferably between 1: 50 and 1:1. A preferred biodegradable chelating agent for use herein is ethylene diamine N,N'-disuccinic acid, or alkali metal, or alkaline earth, ammonium or substitutes ammonium salts thereof or mixtures thereof. 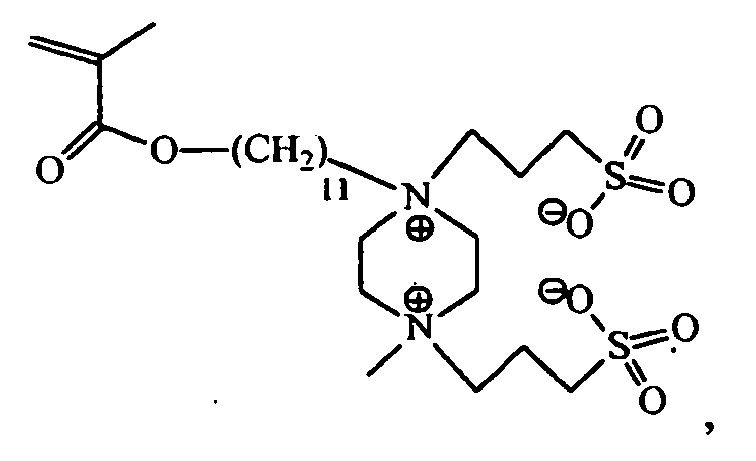 Ethylenediamine N,N'- disuccinic acids, especially the (S,S) isomer have been extensively described in US patent 4, 704, 233, November 3, 1987, to Hartman and Perkins . Ethylenediamine N,N'- disuccinic acids is, for instance, commercially available under the tradename ssEDDS® from Palmer Research Laboratories. The hard surface cleaning compositions of the present invention may comprise a fatty acid, or mixtures thereof as an optional ingredient. Suitable fatty acids for use herein are the alkali salts of a C8-C24 fatty acid. Such alkali salts include the metal fully saturated salts like sodium, potassium and/or lithium salts as well as the ammonium and/or alkylammonium salts of fatty acids, preferably the sodium salt. Preferred fatty acids for use herein contain from 8 to 22, preferably from 8 to 20 and more preferably from 8 to 18 carbon atoms. Suitable fatty acids may be selected from caprylic acid, capric acid, lauric acid, myristic acid, palmitic acid, stearic acid, oleic acid, and mixtures of fatty acids suitably hardened, derived from natural sources such as plant or animal esters (e.g., palm oil, olive oil, coconut oil, soybean oil, castor oil, tallow, ground oil, whale and fish oils and/or babassu oil. For example Coconut Fatty Acid is commercially available from UNICHEMA under the name PRIFAC 5900®. Fatty acids are desired herein as they reduce the sudsing of the liquid composition used in the process according to the present invention. Typically, the hard surface cleaning composition herein may comprise up to 6%, preferably from 0.1 % to 2.0%, more preferably from 0.1 % to 1.0% and most preferably from 0.2% to 0.8% by weight of the total composition of said fatty acid. The hard surface cleaning composition of the present invention may comprise a branched fatty alcohol, or mixtures thereof as a highly preferred optional ingredient. Such suitable compounds are commercially available, for instance, as the Isofol® series such as Isofol® 12 (2-butyl octanol) or Isofol® 16 (2-hexyl decanol) commercially available from Condea. Preferably said branched fatty alcohol is selected from the group consisting of 2-butyl octanol, 2-hexyl decanol, and a mixture thereof. More preferably said 2-alkyl alkanol is 2-butyl octanol. Typically, the hard surface cleaning composition herein may comprise up to 2%, preferably from 0.10% to 1.0%, more preferably from 0.1% to 0.8% and most preferably from 0.1% to 0.5% by weight of the total composition of said branched fatty alcohol. The hard surface cleaning compositions, preferably the liquid hard surface cleaning composition, of the present invention may comprise a solvent, or mixtures thereof as an optional ingredient. Suitable solvent is selected from the group consisting of: ethers and diethers having from 4 to 14 carbon atoms, preferably from 6 to 12 carbon atoms, and more preferably from 8 to 10 carbon atoms; glycols or alkoxylated glycols; alkoxylated aromatic alcohols; aromatic alcohols; alkoxylated aliphatic alcohols; aliphatic alcohols; C8-C14 alkyl and cycloalkyl hydrocarbons and halo hydrocarbons; C6-C16 glycol ethers; terpenes; and mixtures thereof. Suitable alkoxylated glycols to be used herein are according to the formula R-(A)n-R1-OH wherein R is H, OH, a linear or branched, saturated or unsaturated alkyl of from 1 to 20 carbon atoms, preferably from 2 to 15 and more preferably from 2 to 10, wherein R1 is H or a linear saturated or unsaturated alkyl of from 1 to 20 carbon atoms, preferably from 2 to 15 and more preferably from 2 to 10, and A is an alkoxy group preferably ethoxy, methoxy, and/or propoxy and n is from 1 to 5, preferably 1 to 2. Suitable alkoxylated glycols to be used herein are methoxy octadecanol and/or ethoxyethoxyethanol. Suitable alkoxylated aliphatic alcohols to be used herein are according to the formula R-(A)n-OH wherein R is a linear or branched, saturated or unsaturated alkyl group of from 1 to 20 carbon atoms, preferably from 2 to 15 and more preferably from 3 to 12, wherein A is an alkoxy group preferably butoxy, propoxy and/or ethoxy, and n is an integer of from 1 to 5, preferably 1 to 2. Suitable alkoxylated aliphatic linear or branched alcohols are butoxy propoxy propanol (n-BPP), butoxyethanol, butoxypropanol (n-BP), ethoxyethanol, 1-methylpropoxyethanol, 2-methylbutoxyethanol, or mixtures thereof. Butoxy propoxy propanol is commercially available under the trade name n-BPP® from Dow chemical. Butoxypropanol is commercially available from Dow chemical. Suitable aliphatic alcohols to be used herein are according to the formula R-OH wherein R is a linear or branched, saturated or unsaturated alkyl group of from 1 to 20 carbon atoms, preferably from 2 to 15 and more preferably from 5 to 12. With the proviso that said aliphatic branched alcohols is not a 2-alkyl alkanol as described herein above. Suitable aliphatic alcohols are methanol, ethanol, propanol, isopropanol or mixtures thereof. Suitable terpenes to be used herein monocyclic terpenes, dicyclic terpenes and/or acyclic terpenes. Suitable terpenes are : D-limonene; pinene; pine oil; terpinene; terpene derivatives as menthol, terpineol, geraniol, thymol; and the citronella or citronellol types of ingredients. Other suitable solvents include butyl diglycol ether (BDGE), hexandiols, butyltriglycol ether, ter amilic alcohol and the like. BDGE is commercially available from Union Carbide or from BASF under the trade name Butyl CARBITOL®. Preferably said solvent is selected from the group consisting of butoxy propoxy propanol, butyl diglycol ether, benzyl alcohol, butoxypropanol, ethanol, methanol, isopropanol, hexandiols and mixtures thereof. More preferably said solvent is selected from the group consisting of butoxy propoxy propanol, butyl diglycol ether, benzyl alcohol, butoxypropanol, ethanol, methanol, isopropanol and mixtures thereof. Even more preferably said solvent is selected from the group consisting of butyl diglycol ether, butoxypropanol, ethanol and mixtures thereof. Typically, the liquid hard surface cleaning composition herein may comprise up to 30%, preferably from 1% to 25%, more preferably from 1% to 20% and most preferably from 2% to 10% by weight of the total composition of said solvent or mixture thereof. In a preferred embodiment the solvent comprised in the hard surface cleaning composition according to the present invention is a volatile solvent or a mixture thereof, preferably a volatile solvent or a mixture thereof in combination with another solvent or a mixture thereof. The hard surface cleaning compositions of the present invention may comprise a perfume or a mixture thereof as a highly preferred optional ingredient. Suitable perfumes for use herein include materials which provide an olfactory aesthetic benefit and/or cover any "chemical" odor that the product may have. The compositions herein may comprise a perfume or a mixture thereof, in amounts up to 5.0%, preferably in amounts of 0.01% to 2.0%, more preferably in amounts of 0.05% to 1.5%, even more preferably in amounts of 0.1% to 1.0%, by weight of the total composition. The hard surface cleaning compositions of the present invention may also comprise a builder or a mixture thereof, as an optional ingredient. Suitable builders for use herein include polycarboxylates and polyphosphates, and salts thereof. Typically, the compositions of the present invention comprise up to 20.0 % by weight of the total composition of a builder or mixtures thereof, preferably from 0.1 % to 10.0%, and more preferably from 0.5% to 5.0%. The compositions of the present invention may comprise a radical scavenger. Suitable radical scavengers for use herein include the well-known substituted mono and dihydroxy benzenes and their analogs, alkyl and aryl carboxylates and mixtures thereof. Preferred such radical scavengers for use herein include di-tert-butyl hydroxy toluene (BHT), hydroquinone, di-tert-butyl hydroquinone, mono-tert-butyl hydroquinone, tert-butyl-hydroxy anysole, benzoic acid, toluic acid, catechol, t-butyl catechol, benzylamine, 1,1,3-tris(2-methyl-4-hydroxy-5-t-butylphenyl) butane, n-propyl-gallate or mixtures thereof and highly preferred is di-tert-butyl hydroxy toluene. Such radical scavengers like N-propyl-gallate may be commercially available from Nipa Laboratories under the trade name Nipanox S1 ®. Radical scavengers when used, are typically present herein in amounts up to 10% and preferably from 0.001% to 0.5% by weight of the total composition. The presence of radical scavengers may contribute to the chemical stability of the compositions of the present invention. Non-limiting examples of other adjuncts are: enzymes such as proteases, hydrotropes such as sodium toluene sulfonate, sodium cumene sulfonate and potassium xylene sulfonate, and aesthetic-enhancing ingredients such as colorants, providing they do not adversely impact on filming/streaking. The compositions can also comprise one or more colored dyes or pigments. Dyes, pigments and disappearing dyes, if present, will constitute from 0.1 ppm to 50 ppm by weight of the aqueous composition. flushing, the temperature of the reactive environment is brought to 75°C. At 75°C, 0.11g of 2,2'-azobis (2-methylpropionamidine) dichloride dissolved in 0.6g of water is added. A solution containing 82.1g of n-vinylpyrrolidone, 22.9g of SPE and 195g of water, and another solution containing 1g of 2,2'-azobis (2-methylpropionamidine) dihydrochloride and 20g of water are then simultaneously added over 4 and 5 hours respectively. After these additions, shaking and the temperature are maintained over 4 hours. The reactive environment is then cooled to room temperature. The following examples are meant to exemplify hard surface cleaning compositions according to the present invention, preferably used in a process of cleaning a hard surface according to the present invention but are not intended to limit the scope of the present invention. The hard surface cleaning compositions below are made by combining the listed ingredients in the order given using the listed proportions to form homogenous mixtures (solution % is by weight of active material). C 9-11 EO5 is a C 9-11 EO5 nonionic surfactant commercially available from ICI or Shell. C 9-11 EO8 is a C 9-11 EO8 nonionic surfactant commercially available from ICI or Shell. C12,14 EO5 is a C12, 14 EO5 nonionic surfactant commercially available from Huls, A&W or Hoechst. C10 AO7 is an alkoxylated non-ionic surfactant commercially available from BASF under the tradename Lutensol XL 70®. C12,14 EO21 is a C12-14 EO21 nonionic surfactant. NaLAS is Sodium Linear Alkylbenzene sulphonate commercially available from A&W. NaCS is Sodium Cumene sulphonate commercially available from A&W. Isalchem® AS is a C12-13 sulphate surfactant commercially available from Enichem. C12-14 AO is a C12-14 amine oxide surfactant. 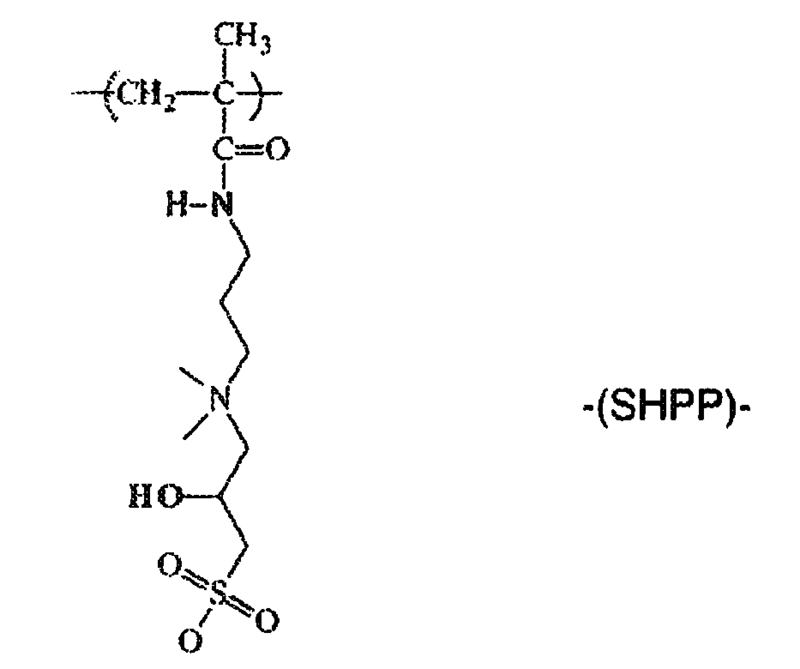 DTPMP is diethylenetriaminepentamethylphosponic acid commercially available from Solutia. Isofol 12® is 2-butyl octanol commercially available from Condea. n-BP is normal butoxy propanol commercially available from Dow Chemicals. n-BPP is normal butoxy propoxy propanol commercially available from Dow Chemicals. Ethanol is commercially available from Condea. MEA is mono-ethanolamine commercially available from Condea. Kelzan T® is Xanthan gum available from Kelco. Fatty acid is a Coconut Fatty Acid. These hard surface cleaning compositions are used in a process as disclosed herein and provide good filming and/or streaking performance as well as good shine performance, when used in a hard surface cleaning application. In addition, when used in a hard surface cleaning application these hard surface cleaning compositions provide good soil repellency performance as well as good next time cleaning benefit performance. Furthermore, these hard surface cleaning compositions show good fast drying benefits on inclined or vertical hard surfaces. 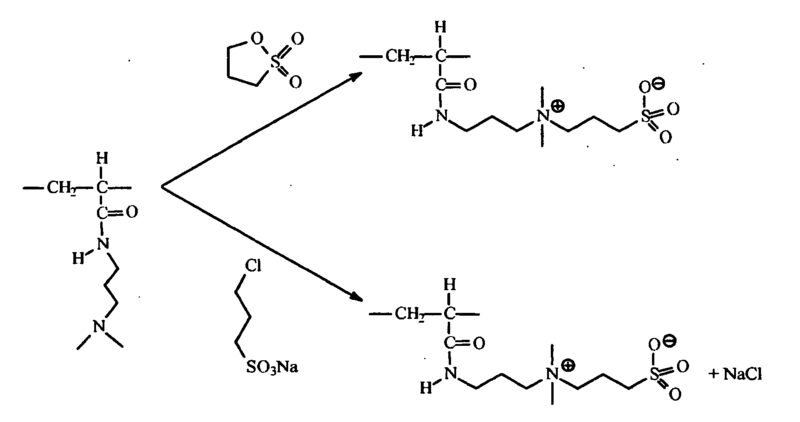 A hard surface cleaning composition comprising a copolymer, wherein said copolymer comprises a zwitterionic unit A and another unit B, wherein said unit A comprises a betaine group and wherein said betaine group of said unit A is a sulphobetaine group, and wherein said unit B is derived from vinyl-pyrrolidone, and wherein in said copolymer said units A and B represent 75 to 100%, in moles of the copolymer unit. A hard surface cleaning composition according to any of the preceding claims, wherein said copolymer comprises 1% to 25% in moles of unit A, preferably 3% to 13% and 75% to 99% in moles of unit B, preferably 87% to 97%. A hard surface cleaning composition according to any of the preceding claims, wherein in said copolymer the molar ratio between said units A and B is between 1/99 and 25/75, preferably between 5/95 and 15/85. - cationic or potentially cationic CC units. A hard surface cleaning composition according to any of the preceding claims, wherein said copolymer is a statistical copolymer. 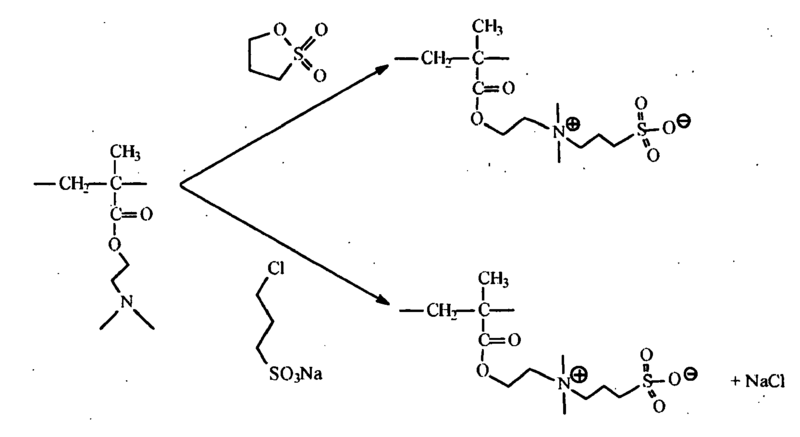 A hard surface cleaning composition according to any of the preceding claims, wherein in said copolymer said betaine group or mixture thereof of said unit A is or are pendant groups of said copolymer. A hard surface cleaning composition according to any of the preceding claims, wherein in said copolymer said units A and B, preferably with other units, form a polyalkylene hydrocarbon chain, preferably broken by one or more nitrogen or sulphur atom. - or is a derivative of a chemical modification of units of a precursor polymer, preferably by chemically modifying a polymer comprising pendant amine functions, with the help of a sulphuric electrophile compound, preferably a sultone. - a free radicals source. A hard surface cleaning composition according to any of the preceding claims, wherein said copolymer is present at a level of from 0.001% to 10% of the total weight of said composition. A hard surface cleaning composition according to any of the preceding claims, wherein said composition is a liquid hard surface cleaning composition. A hard surface cleaning composition according to any of the preceding claims, wherein said composition additionally comprises a surfactant or a mixture thereof. A hard surface cleaning composition according to claim 13, wherein said surfactant is present at a level of from 0.01% to 20% by weight of the composition. A hard surface cleaning composition according to any of the preceding claims, wherein said composition has an acidic to neutral pH and preferably additionally comprises an acid. A pre-moistened hard surface cleaning wipe comprising a substrate, preferably a nonwoven substrate, impregnated with a hard surface cleaning composition according to any of the preceding claims. A process of cleaning a hard surface with a hard surface cleaning composition according to any of claims 1 to 15 or a pre-moistened hard surface cleaning wipe according to claim 16. A process of cleaning a hard surface according to claim 17, wherein said hard surface is selected from the group consisting of bathroom surfaces, preferably selected from the group consisting of : ceramic, glass, enamel, stainless steel and chromed surfaces. 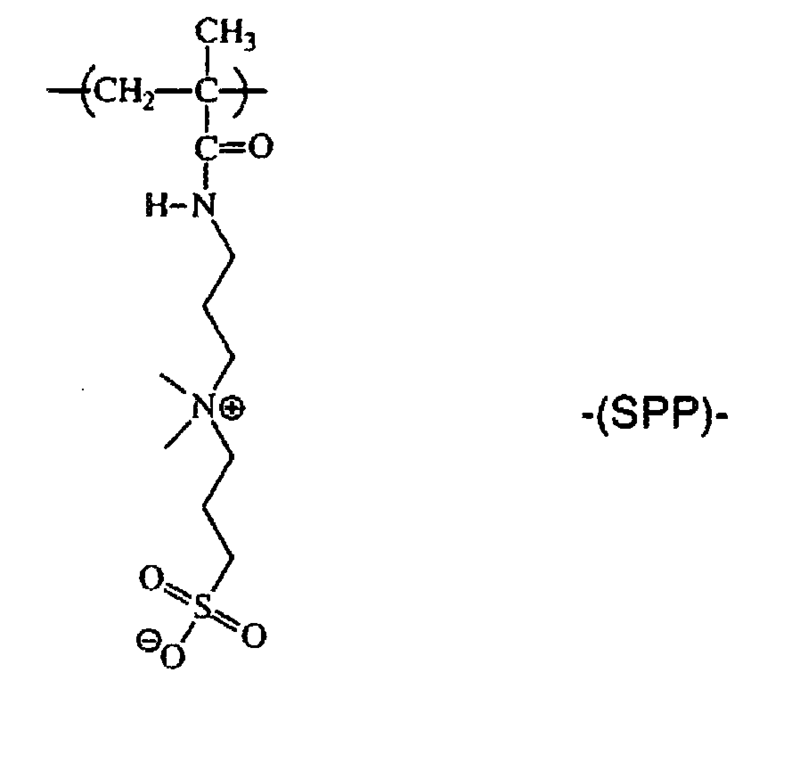 The use of a copolymer, in a process of cleaning a hard surface with a liquid composition comprising said copolymer, wherein good filming and/or streaking and/or shine and/or good soil repellency and/or good next time cleaning benefit and/or good fast-drying performance on inclined or vertical surfaces are achieved, wherein said copolymer comprises a zwitterionic unit A or a mixture thereof and another unit B or a mixture thereof, wherein said unit A comprises a betaine group or a mixture thereof and wherein said betaine group of said unit A is a sulphobetaine group or a mixture thereof, and wherein said unit B is derived from vinyl-pyrrolidone. ES07113156T ES2365050T3 (en) 2007-07-26 2007-07-26 cleaning composition of hard surfaces.